See mom — Easter Eggs DO grow on trees!! Or at least they do in Germany’s Volker Kraft’s apple tree! 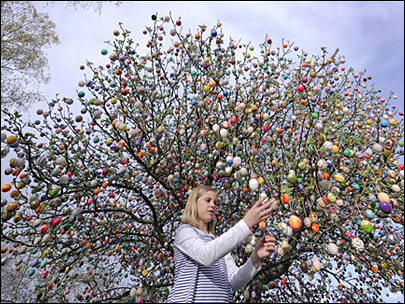 In 1965, the Krafts decked their tree for Easter with 18 artfully decorated eggs — a popular tradition in Germany. 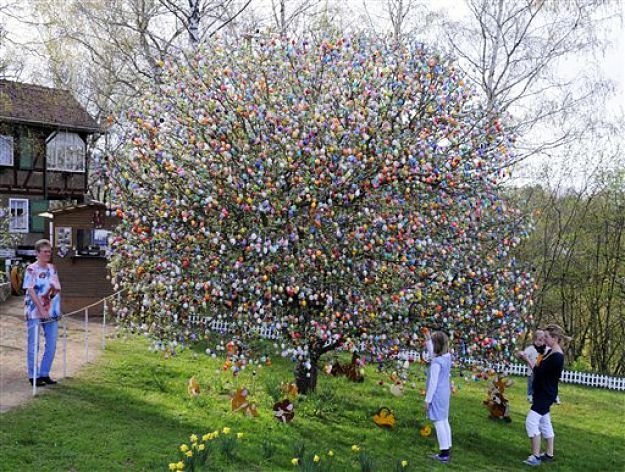 These days, the tree carries 9,800 brightly coloured Easter eggs and is quite the tourist attraction — it drew more than 13,000 visitors last year! What I love about this story is how much of a family activity is has remained. The Kraft’s 40 year old daughter still blows out real eggs and paints them — something she has been doing with her dad since the age of 4! When will they stop?! The Krafts plan to add another 200 eggs next year, bringing his total to 10,000 – and then stop, if only because they’re running out of room to store the mountain of boxes!!! I wonder what they do for Christmas! ?